Provides the knowledge to go from classroom to real world placements in the helping professions. 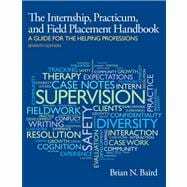 The Internship, Practicum, and Field Placement Handbook, 7/e is apractical guide to the “real world” knowledge and skills that students need when they begin working in the field of mental health. This text guides interns through every phase of the internship process from finding placements to concluding relationships with clients and supervisors. Along the way students learn about ethics, clinical writing and record keeping, working with peers and supervisors, understanding diversity, and self care and safety. Following an evidence and competency based approach, the latest research findings are reviewed from the fields of psychology, social work and counseling. Prepare for the practical, real world experience of working and serving clients in mental health and social service settings. Understand the key issues and tasks that must be performed during different stages of a field placement from beginning to end. Brian Baird Ph.D. is a licensed clinical psychologist and former chair of the Department of Psychology at Pacific Lutheran University. Dr. Baird has supervised hundreds of undergraduate and graduate students in practicum classes and field placements and has worked in treatment settings ranging from brain injury rehabilitation clinics to adolescent group homes and inpatient psychiatric hospitals. He brings a wealth of personal clinical experience plus a strong teaching and research background to give students the real world, practical information they need to develop and succeed as people and professionals in the helping professions. Beyond his clinical education and experience, Dr. Baird also served six terms in the U.S. House of Representatives. In Congress Dr. Baird was known for principled stands, reaching across political divides and for strong advocacy for mental health care and science. He retired in 2011 to return to Washington state where he makes his home with his wife Rachel Nugent, an economist specializing in global health, and their twin 8 year old sons William and Walter. In addition to the present text Dr. Baird provides courses and training on communication skills and has published books on public policy and on how families can enjoy outdoors experiences together. In his free time, Dr. Baird enjoys outdoor activities with his family, including skiing, hiking, climbing and camping.